Call (250) 758-2401 to reserve a rental or ask any questions. Reserve your rental for today or any time in the future! Stop by! Here’s our full contact info and a map to our store. Concrete, stone, and bricks are all wonderful building material until you need to remove them! We’ve got the heavy steel here to put the required muscle into your next renovation to make that concrete shake and break. 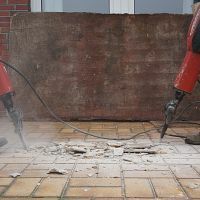 From electric jack-hammers to specialized concrete drilling equipment we have the tools and accessories that will help reduce your back-breaking labour and get you quickly onto the next step in your project. And yes, if you’re fixing concrete, we’ve got all the supplies for that too! Designed for the Bosch Breaker. Designed for the electric Bosch “Brute” Breaker. Professionally sharpened on a regular basis. Note: rental rates do not include bit rental. It’s the plug-in anywhere hammer that doesn’t need a compressor! These 120V/15AMP stand-up jackhammers weigh in at 64lbs and feature shock mounted handles for increased comfort. Great for breaking up driveways, slabs, and other concrete or asphalt structures. See below for bit rentals. The TE 70-ATC Combihammer is perfect for: hammer drilling; drilling holes for heavy-duty anchors; breaching and demolition with pointed and flat chisels; working with wide-flat, hollow, mortar or channel chisels and bushing tools; drilling with high torque in wood and steel. Though it weighs in at under 25lbs, the Hilti TE 1000 are surprisingly powerful and effective dedicated handheld breakers. Running on 115V/15AMPS, both are compact and suitable for many light- and medium-duty chiseling, breaking, or tile-removal jobs. See below for bit rentals. Designed for the Hilti TE 1000 tools with “TE-Y” bit to hammer connection. Designed for the Hilti TE 1000 Demolition Hammer. Professionally sharpened on a regular basis. * NO LONGER available for TE1000. ONLY available with TE70 Hilti. An iron behemoth, with one square end that tapers to a 1-1/2” wide, flat point. These bits will not work with the Hilti TE 7-C, Hilti TE 16-C, Hilti TE 25, or Hilti TE 35-C models (use the SDS-PLUS bits). Note: We do NOT charge any additional sharpening fees for breaker bit rentals. Composite and iron construction. Weighs 12 lbs. 1/2” Chuck, Right-Angle Head, 8-foot Cord. D-handle power and a right-angle drive head make this drill package perfect for stud and joist drilling. Features two speeds: 0–335 RPM on low, and 0–750 RPM on high; also has reverse gear. Head and handle swivels 360-degrees. Includes case and side handle for easy operation. With a larger, 1/2” chuck and higher torque rating, the Hitachi D13VF corded electric drill can run hole-saw bits up to 4” in diameter. Features 415 in-lbs of torque, and 0-850 RPM. Power and torque are the main two benefits of the Hole-Hawg line of drills. The compact design makes it perfect for drilling between studs and joists, while an extra long pipe handle helps you control the power. Features two speed ranges, 1200 and 300 RPM. Hi-torque and hi-speed make this the perfect choice for the heavy duty user. The 3/8” Hitachi D10VC corded drill has forward and reverse, and is great for light-duty work; 0-1800 RPM. Demand can be high for specific rentals during certain times of the year – we suggest calling in advance to make sure we have what you need, when you need it. ©1997–2018 Sharecost Rentals & Sales (1997) Ltd. Rates subject to change without notice.